I remember the days when I could put a loaf of French bread on my table, and there would be none left after the meal. The butter would be used up, too. I was young. I had a good metabolism. I could handle it. Now, I try not to eat so much bread because, let's be honest, we know where it shows up. An aside: Mark tells me that when he was living in Rome in the mid-70s, he was taught that you never ever have a glass of wine or alcohol without also having some food with it, bread at the very least. My converse rule is that you never ever have food without wine. Back to bread. 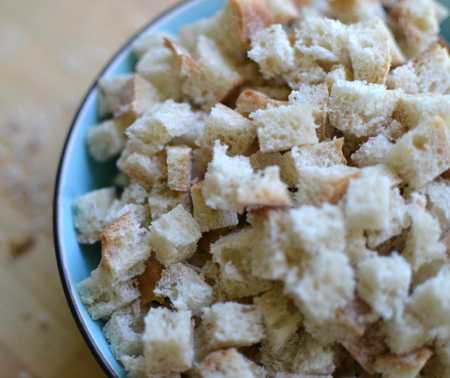 Because we eat less of it now, we often find ourselves with large chunks of leftover bread. Like you, we hate wasting any food. We freeze these leftover heels, we dry them to make bread crumbs, we make French toast. If we lived in a humid climate, we might stick a slice in the sugar canister to soak up all the humidity to keep the sugar from clumping. 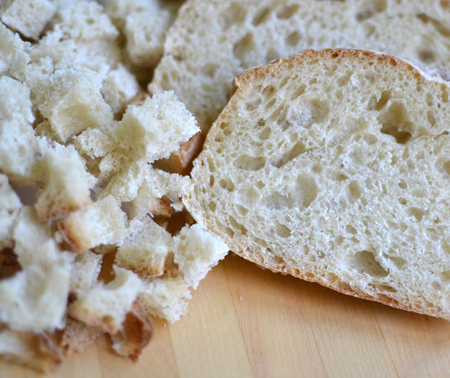 When we had today's recipe in Italy, a loaf of stale bread took on a whole new meaning. As with all peasant dishes, this one is based on what one has on hand. I am sure if you didn't have leeks, onions or shallots would do fine. And if you have only a few ripe tomatoes, some canned San Marzanos thrown in would be perfectly acceptable. 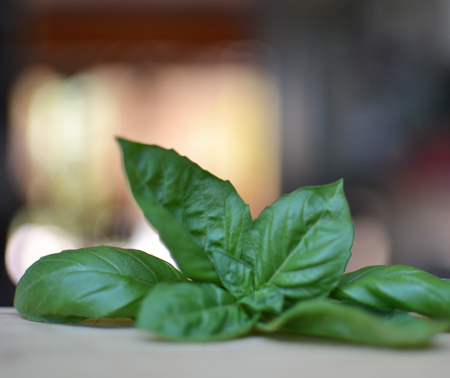 One key ingredient that can't be substituted is fresh basil. I put some in while cooking the soup, and the remainder goes in at the end, just before serving, for that fresh, basil flavor. This recipe will easily feed four... or, if Mark and I are present, two. Heat olive oil in 4-quart soup pot. 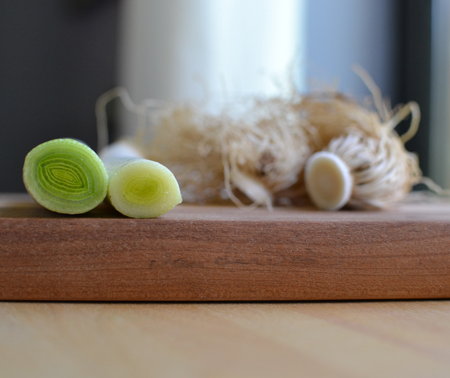 Using only the white and light green parts, slice leeks in half lengthwise and then slice thinly into half rounds. Add leeks to the olive oil with the chile flakes. Cook over medium heat until leeks are soft, but not browned. 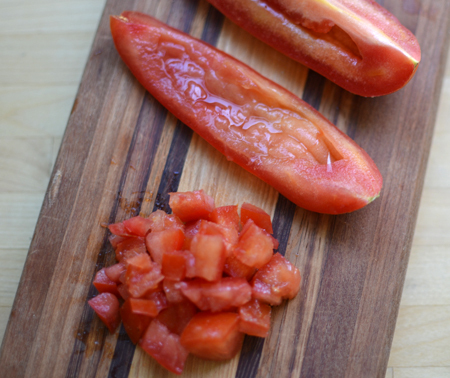 Meanwhile, cut tomatoes, lengthwise into quarters and remove the seeds. Dice the tomato quarters. When leeks are soft, add the diced tomatoes and half the basil leaves (whole) and sauté for 5 minutes, or until the tomatoes begin to break down and release their juices. Add broth and water, and season with salt. Bring to a boil and then add bread cubes. Boil for 2 minutes then cover and remove from heat. Let sit for 45 minutes. Chop remaining basil and add before serving. Serve with a drizzle of olive oil and a sprig of basil. This soup is good either hot or at room temperature. Serves 4 as a hearty lunch or supper. David, first of all I am totally in love with that beautiful soup plate (might not be the proper English term for it), goodness it looks so very Italian! 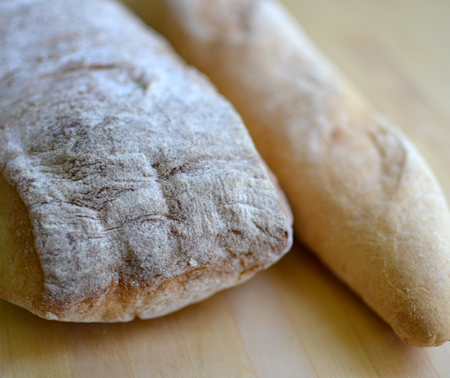 And secondly, your recipe sounds just like perfect summer fare - we always have leftover bread (I have a whole Ciabatta loaf left over from lunch today) and I always appreciate those rustic yet delicious recipes that make really good use of that(still good) bread. 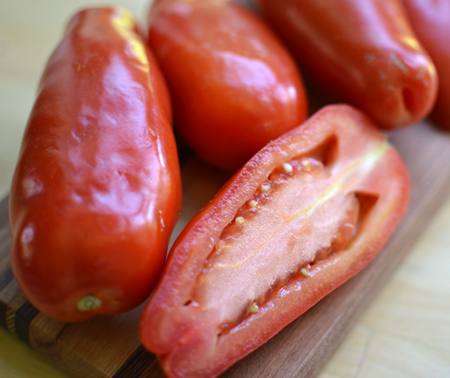 You used those wonderful San Marzano tomatoes that we can only find at our favorite Italian store around here. It all looks so very appetizing and wonderful and your photography is amazing! Ah, the joys of summer cooking! Ich wünsche euch noch ein wunderbares Wochenende and liebe Grüße aus Bonn! Andrea - Ich denke, daß manchmal ich jetzt meine Teller für Dich wähle! Yes, it is an Italian soup plate - we got it over a decade ago in Certaldo Alto, and it is one of our favorites. As you can see, I used a ciabatta (although not a perfect one - there might have been less bread if it had been!) for the soup. We have been so lucky that one grower here decided to grow only heirloom tomato varieties and his San Marzanos are a favorite. I get them every week and, no matter what I do with them, I am so happy with the results. As the season ends, I will be oven-drying them for the winter. It's actually very rare to get any bread left-overs in my household. Dean and I both love our bread, especially wood-fired sourdough. If there is a small piece I usually blitz it into crumbs. I do like the look of this soup. It's something that reminds me of panzanella, that bread & tomato salad, also with basil. John - this is, indeed, the soup version of panzanella. We love both, and make them all summer. Thanks, Laura - I have been having fun playing with depth of field. The chile photo was one of my favs too. Warm weather is coming your way soon! Pappa al Pomodoro...oh yes you are correct everything sounds better in Italian..sigh..:) What a great recipe and a brilliant way to use up bread! your recipes are truly beautiful. love the shot of the leeks - so cool! Beautiful! I am looking forward to tomato season here to make this! I am always trying to find things to do with leftover bread! 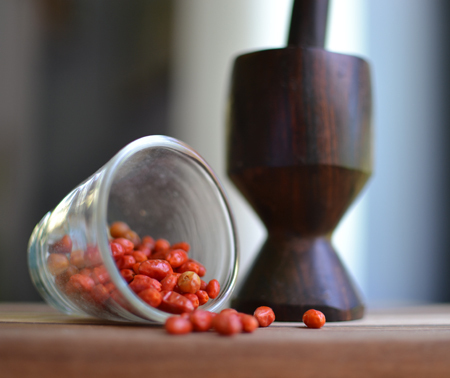 I love that we speak of tomato season... What are the fours seasons? Asparagus, tomato, squash and soup/stew? I love your side note! I completely agree. And I wonder how we could eat the real food after so much oil dipped bread and wine. 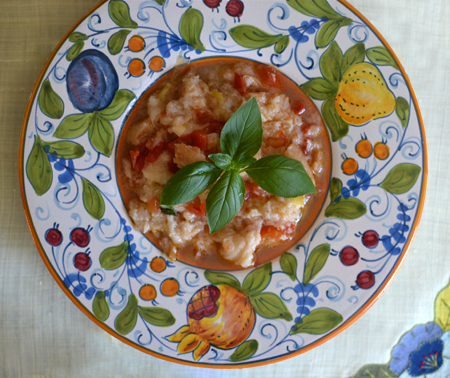 I adore pappa al pomodoro, or should I say I am mad about bread and tomatoes? They're one of those unbeatable combinations, by far! I used to make myself tomato sandwiches when I got back from school, just bread and salted tomatoes. The plate in the last pic is gorgeous! Paula - that is so true - after the bread and wine I can usually go right on to something chocolate... I love tomato sandwiches, eating them over the sink and letting the juices drip down your arms... Such happy summer memories! 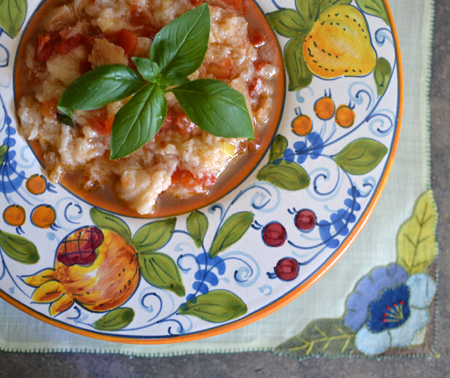 This is a perfect summer dish -- fresh basil and tomatoes will be coming in in bushels soon. I love that it uses up stale bread, too. Really lovely. Hi Amy! 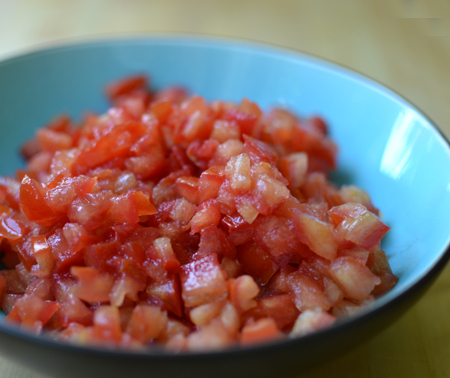 Yep - this IS the season for Pappa al Pomodoro and for panzanella, as well! I love it!